I'm a list-maker. To do lists, grocery lists, idea lists, lists of books I've read, you name it, if it needs to happen in my world it ends up on a list. Conversely, if it's not on a list, it doesn't happen. The Hub and Hooligans have learned this truth the hard way. I am such a list maker that on our first anniversary while enjoying dinner at Monti's Steakhouse, I looked at the Hub, giddy that we had clocked in our first year, and said, "Let's make a five year plan." Yes, of course it would have been in the form of a list. He looked at me in horror, raised his hands with fingers pointed like they were six-shooters and said, "Uh, I'm more a seat of the pants kind of guy." Equally horrified, we spent the rest of the meal in awkward silence. Now we laugh about it, but at the time we were both thinking, How did I not know this about this person? We are doomed! Needless to say, I made a list about this situation, how we could manage this compulsive divide, and Hub did not. Somehow, despite his lack of lists, we have survived. While struggling with a scene the other day, I came to that fictional crossroads, you know the one, where the story can go this way or that way and still allow the plot to follow the loosely penned outline in the proper direction. I couldn't decide which way to go. It was maddening. I closed my laptop and found a piece of paper and started making two lists, each one spelling out the ramifications of each direction. The answer became clear and my faith in list-making was confirmed. 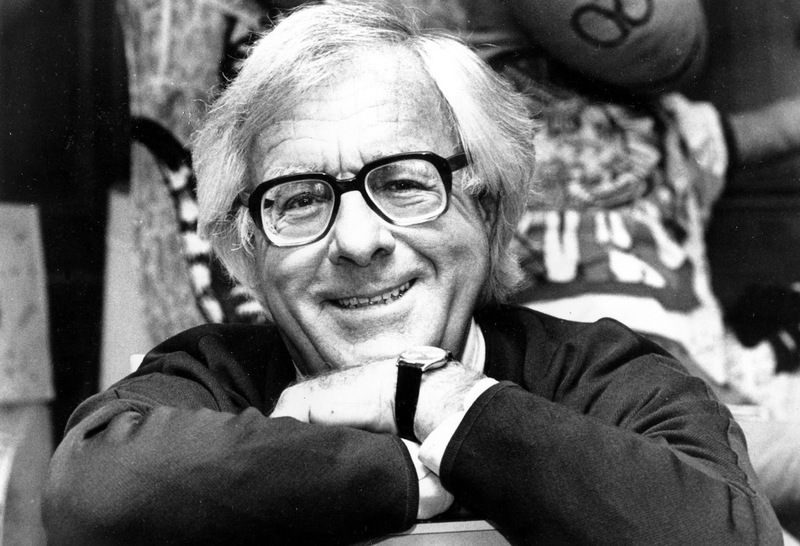 Curious to see if I was the only compulsive list-maker out there, I did some research and found a fabulous article about Ray Bradbury and the value of lists: Ray Bradbury on How List-Making Can Boost Your Creativity. You can click on the title above to read the whole article on brainpickings.org, but the line that got me was: "These lists were the provocations, finally, that caused my better stuff to surface. I was feeling my way toward something honest, hidden under the trapdoor on the top of my skull." YES! You really can't argue with Ray Bradbury, now can you? Well, I’m certainly not going to argue with Ray Bradbury . . . I had the great pleasure of meeting him several years ago at a book signing at Mrs. Nelson’s Toy and Book Shop in California. Lists are good. But my downfall is my propensity to make them on any little scrap of paper I happen upon --- with an unfortunate tendency to end up misplacing them . . . . List maker here. I used to have lots of paper, too, Joan, until I put OneNote on my phone, laptop, tablet, and desktop computer. It syncs across all devices, so if I add an item to a list on any one of them it goes to all of them. It's brilliant, and as long as I have my phone I always have the current grocery list with me. I'm also writing three different things in OneNote, and kept all the documentation for a three-week trip to four countries there, as well. My middle daughter is such an inveterate list maker that she keeps lists of her lists. They used to fill notebooks, but she's the one who told me about OneNote. Is there anything more satisfying than crossing off completed tasks? Your husband is missing out, Jenn! But for creative pursuits - I'll have to consider that. I do find that when I'm at that kind of crossroads, or just a bit lost in the book, stepping back a few paces into my office upholstered rocking chair (which was my grandfather's and is just my size) with a notebook and pen to scribble questions and ideas always reveals the way to go. It's just not in list form. Karen, it might be time for me to check into OneNote. Is it a Windows/Android thing or for Apple products? Lists of lists - okay, Karen - your daughter has me beat. I am such a procrastinator that I do a lot of list transferring - you know when you make a new list and transfer the old items like they haven't been sitting there for a week. Cannot live without lists. Seriously, they are the strings that hold my life together. I have a spiral notebook where I keep a running list, and then a zillion little pieces of paper where I make the daily intra-list. The spiral notebook ,which lasts several month, is such an almost Proustian document, and almost like a diary. I am very fond of it. And what is better than crossing stuff OFF??? Sometimes I add to my list things I have already completed just so I can cross them off. Little pleasures. And it makes my accomplishments so tangible. Yeah, lookit all I did! You know? Jenn, writing lists made a difference for me. I noticed that in high school and college, my GPA improved if I wrote lists AND jotted dates of projects due / exam dates in my academic calendar book. My 6th grade teacher stressed the importance of lists. Karen in Ohio, OneNote sounds great! Joan - the lost lists - that's me with story ideas. I'll write one down on a scrap of paper and put it in the black hole (my purse) never to be seen again. Sigh. Oh, and the Jungle Red comment above is me. I keep forgetting to sign out of blogger. Maybe I should put that on a list! Hank - the joy of a crossed of item is a thing of beauty! Someday, you have to show me your notebook! Ray Bradbury is one of my all-time favorite writers! Thanks for reminding us about his fabulous advice. I'm a list-maker. I use the Notes app on my iPhone so it syncs across all my devices. It's a great way to keep track of stories ideas, stuff I need to do, and books I've read/want to read. Cathy - I use the notes app in addition to my paper list.The paper stares back at me from the counter so there's a little more accountability there. Edith, OneNote is part of the Microsoft Office suite. So you can use it with Word or any of the other Office programs. My list-making daughter is a project manager for an energy consulting firm, and she has to keep track of all kinds of things. Using OneNote helps her stay on task, plus she can share various files and whatnot with team members. Whoever fixed the comment section: kudos. I'm combined. At the day-job, I work so many projects that I have to make lists: lists of release dates, what has to be done for each project, maintenance, etc. At home, we joke that if something isn't written on our family whiteboard, it doesn't get done/bought. So I guess that's a list. Grocery shopping is far more organized when we do a list. But for creative endeavors? I have to start a story free-form. Write and see where it goes. Throw ideas into Scapple and see how they connect. And from there, I can start formulating a list of scenes to write. When I'm trying to finish a project, a list of "what hasn't happened that must" is sometimes helpful. Not so big on daily to-do lists (but The Hubby lives and dies by them). Scapple? Excuse me - I must go investigate! Oh, and Edith - OneNote is a Microsoft Product, so there are probably version for both Android and iOS. I'm a type A+, list-making, mildly OCD individual who uses Google Keep to great effect. I've found that list-making works for me in the sense of getting the main points down and pantsing a little in between. So grocery lists get the Must Haves but I make sure there is room for the Hey, That's Neat (which happens a lot of Trader Joe's). Same for my writing - high points of each chapter then room to play in the getting from bullet point to bullet point. I need that because if I don't force myself to make the space to pants some of the time I can get too rigid and that strangles creativity. Just like I don't want to have missed the Chicken Spring Rolls, I don't want to miss the chance to find a compelling new way to get from point A to B.
I'm definitely not a list maker. The one exception has become a list of book review dates so I can remember for sure when I've agreed to review certain books. Okay, I should amend this. I'm not a list writer downer. I have a list, but I almost always keep it in my head. I'm too lazy to write it down. The day I start forgetting things, I'm doomed. Terrific to see all the list makers. My list making is confined to grocery shopping. Then if I'm really lucky I remember to take it with me. :) My spouse is a bit OCD & has numerous lists. I'm the ADD half, so when I make lists, I often can't find where I put them. Yes, I try to follow the list when I'm at the store, but I frequently just hit the aisles so something I see might remind me "Oh, we haven't had this in awhile". Like Mary Sutton, I use Scapple for creativity. I love sticking ideas here & there, knowing I can move them around as needed. Lists, lists, lists. Grocery lists. Daily to-do. Long term to-do. And writing to-do, both in a broad sense (things I need to read or watch or research, etc.) and short term (what needs to go in current scene or that day's work.) Otherwise I would never get anything done. And, yes, I do add things I've already done just so I can cross them off. And I keep a spiral notebook like Hank's, and I save them when they're finished as they are an interesting (at least to me) record of my life. I have OneNote but don't remember to use it. There is something about actually writing things down that somehow connects them to my brain. Jenn, I love Ray Bradbury. Am going to go back and read the whole piece. And sorry for completely missing yesterday. It was a crazy book tour day! Sounds like you've achieved perfect balance, Kaye! If it's not in writing, it won't get done, so YES, I am a list maker! There are recurring items on my different kinds of lists, there are things that seem to take forever to get crossed off, but I couldn't function without my lists. I remember beginning to make mental lists when I was in sixth grade, but back then I called them by a different name. (I think it was " obstacles to be overcome." I was probably a little OCD-ish about it!) 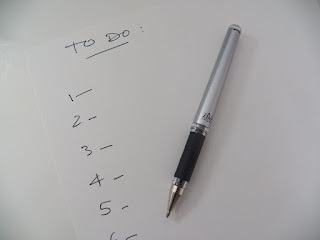 I don't remember when I transitioned to written lists; I just know it was a long time ago! Ha! 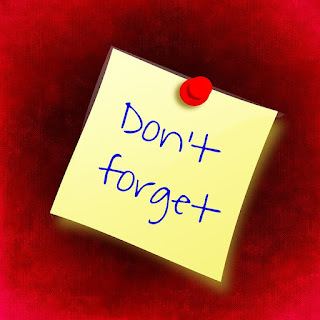 Deborah - I just emailed a reminder to myself and then put it on my master list. It's a process! Joan, I'm so jealous! I love Ray Bradbury's writing - I devoured everything of his when I was a teen. So I read Bradbury's article, and it's fascinating. Not about making lists of things to do, but simply lists of words that resonate and that build off one another. A type of brainstorming from which he teased out story ideas. I've never tried it, but I think I will. Jenn, as to the lists you do at a plot crossroads - I do a form of that, but I call it a decision tree. I start with options and ideas for what might happen next, and then trace it down, creating branches and results based on what characters might do. I can put down the most far flung and absurd things if I want to, and I find it very freeing - when I see a line that leads to something exciting, or another facet of the story opening up, I can start writing it for real, knowing (roughly) where it will lead. Also, the article you link to led me to read a pdf of "R is for Rocket." Thanks for a little Bradbury on a snowy day! Oh, I like the branching out idea, Julia. I was just working on my blog for Saturday about titles and it reminded me how much I love Bradbury's title Something Wicked This Way Comes (as well as the story) which of course he got from MacBeth by Shakespeare, who I also reference in my blog about titles, leaping off with a quote from Romeo and Juliet. You just can't help but look to the great ones. I seem to be having a very Shakespeare/Bradbury week. Weird. I'm definitely a list-maker, and although I've tried to make the transition to One Note, there's something about writing by hand that makes a difference. I guess my brain doesn't engage with the information in the same way if I type it. I wish it did, because it would be so much easier to put the info in one place and have it sync across my devices, but alas. It's great reading about the different plotting tools everyone uses. Julia's decision tree and the other suggestions sound really helpful. Add me to the list of list-makers! And like Ingrid, I write many of them by hand, although I do have a master project list and a marketing list and a revision plan for the WIP on my computer. But writing by hand helps me identify and remember. The whole point, for me, is what Jenn said: making the lists frees me from having to remember stuff in my head, so I can use my brain for other things. A preponderance of proponents of the list. Add me. Though my day-to-day life requires little in the way of list making, a few chores and grocery list, for which I use the Reminders app on my Mac. However, I make lists, large ones, in cataloging things. I have all the books cataloged, any book incoming or outgoing is added/deleted. I keep separate catalogs by genre (I use Word for all this). I also keep lists of every book I read, with a simple 1-5 rating, sortable by title, author, genre, rating. I also have catalogs of all my CDs (a couple thousand, or more), DVDs, artwork we own, the garden (plants bought, lost, when & where planted, etc), there is even a listing of the quilts my wife makes. So, list maker: a little; cataloger: very much so. I wish I'd recorded a list of my plants, Rick. I went through a killing phase (not on purpose) that I would do well to remember. When I worked I absolutely had to have lists. Due dates, client lists, project lists in order of priority(I trained my boss to do this!). Now that I am self-unemployed, not so much. I'll make a grocery list of items to pick up for Mom. One for us. If I have errands I'll list them: library, Rx pickup, bank, Salvation Army drop-off. My brain is such I'll forget to do the main task if I don't write it down. I keep a list of authors and books, Xmas and birthday gifts I've given each year, who I sent cards to. This time of year I make a list of all the tax returns I need to do for family, and gleefully cross each one off as I complete it. Ugh. I need to start that list today. They are comforting, aren't they? They satisfy my rage for order. Interesting that so many are list makers. I find comfort in lists, it shows progress when being retired means I could just sit. I loved the story about 5 year plans, I think I made my first five year plan when I was 14. Lists also help keep me on track, did I take those pills? check the list. Bradbury's There will come soft rains", chilling and lyrical. Some authors are not allowed to die. He was one of those. Coming in late again. I am definitely a list maker, especially where reading is concerned. Currently, I have a Reading List for 2017, New Books in 2017, Books to Take to Hawaii in March, Bouchercon 2017 Reading List, and New Series Reading for 2017 (not new series, but new series to start). Oh, and I have lists for Favorite Books, Favorite Children's and Young Adult Books. I have a list for when I get to visit England and Scotland, places I want to visit and pubs and hotels. Then, when I do travel, there are the list of things to pack, a check list to be completed.